Authentication and Authorization is very crucial to all applications. However, defining authentication and authorization mechanisms for application access doesn't guarantee end-to-end security of an application whether it resides within a local system or made accessible over a network. Authentication and authorization mechanisms just contribute to verifying the user's identity. These mechanisms confirm the user is who he or she claims to be and define what actions the user is allowed to perform after granting access to the system. In addition, you would need to ensure the confidentiality and integrity of the communication and data exchanged during the application access and also to ensure non-repudiation and accountability make sure all actions are logged and available for audit. Ther Server (ASP.Net WebAPI) - NodeJS, PHP etc will also work fine. This is a fairly simple API that handles user login and token generation. It also fetches the logged in users roles. We want all anonymous users to be redirected to login page when they navigate to our application. We want to save information about the user to a local storage for subsequent checks. Let's start by looking at the ASP.Net WebAPI. Its just a simple web api that uses Microsoft.Owin.Security.OAuth for token generation. I created a class that mimic getting data from a data store. As you can see in the GetUsers class, I have added two users - admin and user with two different roles for each user. I have specified the route that will handle token generation in the startup class - "/api/auth/token"
In the getroles actionresult, we are just fetching the logged in user details. In the angular app where we have most of the work, I have created to component - loginc omponent and dashboard component. The first thing we need to do is to protect the dashboard component from been accessed by an anonymous user. We will be making use of route guard to achieve this. In this case we will be using CanActivate to protect our route. The signin method is responsible for logging in and token generation while the getuserroles fetches all roles for the user. The authguard is now used to protect the dashboard route from been accessed by anonymous user. 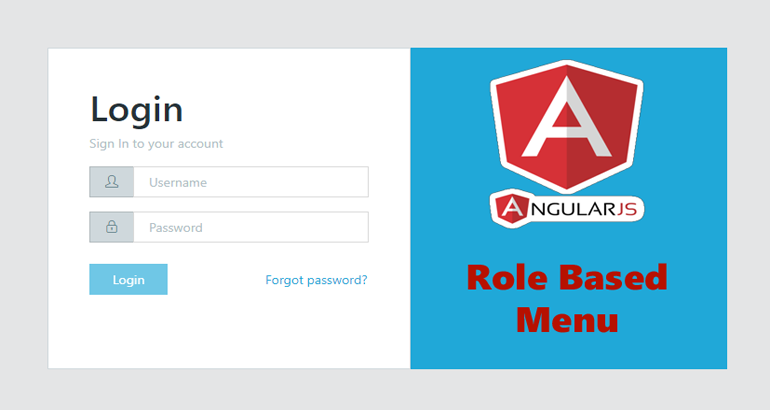 In order to show or hide menu based on user role, we need to find a way to check logged in user's role against all roles that can access a particular route. The *ngIf="userInRole(['admin','superuser','user'])" will check the logged in user roles against those roles that were specified in the array and show or hide menu. This can also be used to hide or show any component in the application. The full source for both the server and the client can be downloaded here.